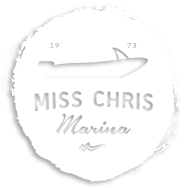 The Miss Chris Marina is a full service Marine Science, Watersports and Fishing center conveniently located at the entrance to Cape May on Schellenger's Landing, near the Lobster House. By land we are two blocks from the Garden State Parkway. By sea we are adjacent to the Cape May Canal on the Intercoastal Waterway. We are the closest marina to the Delaware Bay and Atlantic Ocean. The Marina was founded in 1973 by Frank Speigel and his wife Chris. The Marina was founded in 1973 by Frank Speigel and his wife Chris. He had been a charter boat captain and wanted to break away from South Jersey Marina. He purchased multiple lots on Spicer Creek and set out to build his marina. He moved his boat the Miss Chris to the Marina. He then built two new boats, the Miss Chris II and Lady Chris. He ran Half Day, Four Fishing Trips and Full Day 8 Hour Fishing Trips and Night Fishing trips from the Marina. He rented slips out to other boats over the years. Other party boats for 6 hour fishing, charter boats, a dinner cruise boat and commercial fishing vessels called the Miss Chris Marina their home. He sold his own vessels to Fred Ascoli in the late 1980s. In 1993, Frank sold the Miss Chris Marina to Herman Volme. Herman had been attempting to purchase an existing business in Wildwood Crest and was unsuccessful. Jeff Stewart was his manager and point man to establish a new Whale Watching vessel in Cape May. Jeff had been hoping to find a small property, but the purchase of the Miss Chris Marina led to a larger undertaking. Captain Jeff Stewart recommending bringing on long time friend and avid fisherman, Captain Bob Lubberman as manager of the Marina so that Captain Jeff Stewart could concentrate on managing and running the all new Cape May Whale Watcher. Bob brought an abundance of fishing knowledge as well as technical expertise to the Marina. What was a small marina with a few boats developed into a large fuel dock, tackle shop, gift shop, and Kayak Rentals. In 1996, Captain Jeff Stewart with wife Mary and help from his parents Robert A. Stewart and Elizabeth Stewart purchased the Cape May Whale Watcher from Herman. In 2002, Captain Jeff Stewart and Family purchased the Miss Chris Marina from Herman and kept Captain Bob Lubberman as the manager of the Miss Chris Marina. Bob continued to expand the Marina. The Marina does rent boat slips, but also became a hub for transient boaters. It is a known “affordable” stop on the Intra Coastal Waterway. The fuel dock is popular with the Boat US discount among boaters. What started out as a few Kayaks, now is a fleet of over 100 Kayaks, 20 Stand Up Paddleboards and four boats for rent. You can rent a boat and fishing or crabbing gear and enjoy a day on the water as your own captain. You can come down early in the morning and walk aboard for Full Day or Half Day Fishing from April to December. You can try a Kayak adventure on your own or take a tour. Stand Up Paddleboards are fun as well as a great work out. Families with no experience can come on down and head offshore for Whale and Dolphin Watching or try the inshore around the island cruises in the morning and evening. Bird Watching on board the Osprey dives into the Saltmarsh Back Bays in search of Birds and other critters. Cape May Harbor lots of history and the United States Coast Guard Training Center for new recruits. History Cruises, Lighthouse Cruises, Dinner Cruises, Fireworks Cruises, the Atlantic City Air Show Cruise, Wine Tasting Cruises and much more all depart from the Miss Chris Marina. The Marina is also an important educational center. Since 1993, thousands of students have boarded educational cruises departing from the Miss Chris Marina to learn about the marine environment. The Delaware Bay, the Great Saltmarsh and the Atlantic Ocean all combine in Cape May for a unique natural phenomenon that produces an abundance of wildlife. Fishing Trips, Whale and Dolphin Watching, Kayaking, Birding and more are all excellent educational tools for students, both in school and out. Captain Bob Lubberman loves to share his knowledge of the local species, from baitfish to Raptors. He can make something as simple as grass shrimp, eels and minnows into a very educational experience. Horseshoe Crabs, Blue Claw Crabs, and smooth dogfish are among other frequently found species at the Miss Chris Marina. Captain Bob Lubberman loves to share his knowledge of the local species, from baitfish to Raptors. The Marina is also a place to simply relax. As a public place that faces west, out over the great Saltmarsh and Spicer Creek, it is an excellent spot to enjoy the Sunset. Painters, photographers and landlubbers alike can all enjoy the Sunset. Birders will take joy in being able to view three spate Osprey stands from the Marina. Bring your own scope or talk to Bob and he may be able to rent you one. Parking is free to all Miss Chris Marina Patrons. Restrooms are available. Dockage is available by calling the Tackle Shop as well as daily fishing reports and general information.